You’ll have to forgive Sam Porter for not dreaming of a white Christmas this year . . . especially if the “white” comes in the form of ice. Porter, Oklahoma Baptists’ disaster relief director, is used to dealing with emergencies and disasters across the country and around the world, but as the year 2007 draws to a close, he has led the Baptist General Convention of Oklahoma’s 2,500 trained disaster relief volunteers to respond to a record number of disasters in his home state. “This is the seventh presidential disaster declaration for the state of Oklahoma in 2007, and we’ve worked every one of them,” Porter said Dec. 11 as he sat at his desk in the Baptist Building directing the convention’s response to an ice storm that struck the state Dec. 8, leaving one-third of the state’s population without power at one time or another and leading to at least 20 fatalities. The state also was hammered during the year by another huge ice storm in January and flooding and wind damage during the summer months. The Baptist Building was closed on Monday, Dec. 10 as the capital city was virtually blacked out by the ice storm, which snapped tree limbs and brought down power lines in an area north of a line from Hollis to Mangum to Oklahoma City to Vinita. As is the norm in disasters, Southern Baptist churches stepped up and led the way in providing relief. Of the initial 21 American Red Cross shelters set up across the state, 11 were at Baptist churches, including Bixby, New Beginnings; Bristow, First; Broken Arrow, Arrow Heights; Chandler, First; Collinsville, First; Commerce, Southeast; Oklahoma City, Trinity International; Owasso, Freedom; Sapulpa, First; Sperry, First and Tulsa, First. 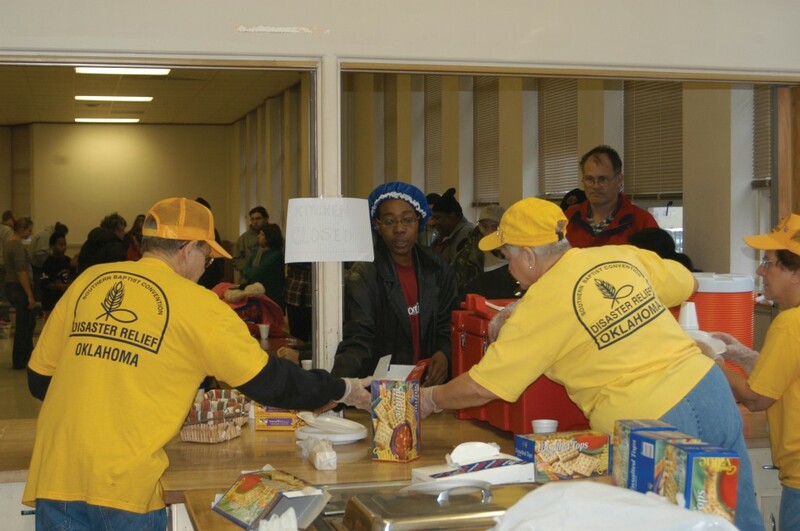 Disaster relief feeding units from the Tulsa Metro Association were operating at Sapulpa, First, and Broken Arrow, Arrow Heights, and an Oklahoma City Zone unit was at Oklahoma City, Trinity International. The Sapulpa, First kitchen later was moved to Sapulpa, Ridgeway. The Oklahoma City unit was moved to the Cox Center downtown the evening of Dec. 12, when city officials closed the area shelters and moved metro area storm victims to a centralized location. Porter said the Muskogee Association feeding unit also was operating at Miami, Immanuel. “Some of the meals from Sapulpa were being sent to Miami, Welch and Commerce. “We’re talking a long distance,” he pointed out. Miami was dealing with its third declared disaster of 2007 and its second ice storm after a similar storm hit the area in January. The town also was inundated by torrential rains which resulted in flooding that destroyed 200 homes and damaged hundreds more in July. Porter said preparation is essential for churches to be ready to respond in a disaster or emergency situation. “The e-mail I sent out last week to alert all of our volunteers is an example,” he said. “Wes Johnson did that, and that’s why Chandler, First was able to set up a shelter. He got with Lincoln County officials, and they set that one up Monday. Then, their church members picked up the people who had special needs, such as those on oxygen, and brought them to the church. Porter said the magnitude of the storm was unprecedented. “We are in an operation mode that is unusual in that as of this morning (Dec. 11) there are 600,000 customers without power. Multiply that by at least two, and that means that more than one-third of the population of Oklahoma is without power. “Our kitchens can’t feed that many people, of course, but if our churches each would become disaster prepared, be proactive and figure out those small things they can do, they can impact their community in a great way. Oklahoma City, Northwest was one of those churches which responded immediately to the need when it was shared with them. Asked to provide housing and food for up to as many as 100 chain saw crew volunteers coming in from other states, the church quickly put a plan into action to do so. Within 24 hours, sleeping quarters were secured, a daily, three-meal menu had been worked out and volunteers to serve the meals were being recruited. In the Tulsa area, BGCO Volunteers in Missions coordinator Norman Wagoner had lined up several churches to host chain saw crews, including Woodland Acres, Eastwood and Southern Hills in Tulsa; Collinsville, First; Broken Arrow, Arrow Heights; Owasso, Central; Collinsville, First; Skiatook, Lakeview Southern and Sperry, First. Wagoner said Dec. 12 that 80-90 percent of the churches in the Tulsa area were without power. Porter requested 10 chain saw teams to be sent to Oklahoma City and Tulsa by national SBC disaster relief director Terry Henderson at the North American Mission Board to help with clean up. He said seven teams from Texas, and one each from Louisiana, Virginia and Tennessee were on their way to Oklahoma as of Dec. 13. “The teams will work on jobs from their home base to Stroud and back in each direction,” Porter said. That would be in addition to the eight chain saw teams from Oklahoma that are already working. It’s going to be a huge job helping clean up the thousands of limbs fallen from trees, many of which look as if they have exploded from the inside as they collapsed from the tremendous weight of the ice. “We’re going to have to focus on priority ones-if a tree is on a walkway, driveway, house or car-and walk away from trees in a yard right now,” Porter said. To handle the anticipated hundreds of requests for debris removal, Incident Command Centers were being established at the Baptist Building in Oklahoma City and at Tulsa, Woodland Acres. People who cannot afford to pay for debris removal may call either 405/516-4828 in Oklahoma City or 918/742-7313 in Tulsa for assistance.